Famous for our big city feel without the congestion, the stunning coast line, diverse night life and food culture, Geelong is a place for everyone. Getting around is simple with easy to navigate road networks and intelligent bus networks making for a highly accessible city. Spend more time doing the things you love with sporting facilities, shopping and café precincts within arms reach across Geelong. Geelong is famous for sport and leisure, with the second oldest Australian Football team and great opportunities to play a wide range of sports. 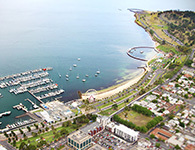 Geelong combines a beautiful coastal location with modern and historic attractions. Experience quality dining experiences, boutique bars and pubs and a variety of shopping options from large shopping centres to boutique shopping strips. Geelong is known for its events and festivals, including sport, music, cars, food, art and markets. Geelong is a multicultural, community minded city with opportunties to participate in many local community activities. There’s enough to explore in Geelong itself with its stunning Waterfront, whimsical bollards, landscaped botanic gardens, cafes and restaurants – not to mention its gallery and unique museum. You can take a dip in the art-deco style pool and kick back in the promenade complex and restored pavilion at Eastern Beach too. But as the gateway to The Bellarine Peninsula and Great Ocean Road, many more adventures are conveniently close.